It is true, right outside of Nazca (there are signs that say Nasca when you enter town so I am confused on how to spell this city) we hit the 10,000 mile mark! From Alex’s house in California to Nazca has been a crazy ride, and we have cherished every mile, though many haven’t been easy. 12 countries, 68 cities, 3 pairs of underwear (for Nathaniel anyway). We are currently in Cusco, which is very close to being on the same latitude with Cuiabá, Brazil, considered the geographic center of South America. What this means is we are about halfway through with our travels in South America and we have a little over a month before we should be rolling into Ushuaia. Moving on from the nostalgia of the 10,000 mile mark, the ride from Pisco to Nazca was more of the same desert and sand we had been riding in since getting to Peru. On the outskirts of Nazca is a giant steel tower where you can view two of the Nazca Lines (‘the tree’ and ‘the hands’), though you don’t really get the kind of view you do from an airplane. We stopped on our way into town and paid the equivalent of $0.71 to climb to the top of the observation tower. After reading several reviews of how to book tours by air of the Nazca Lines, we got up early the next morning and went to the airport to commandeer an airplane. There are several vendors at the airport, and as we arrived the security guard told us to make sure we shopped around, although they all seemed to offer about the same rates. Online they listed the price at being around $90, though the range seems to vary from $80-$100. We were quoted $75, and decided to go with Aeroparacas for a 35-minute flight. As noted though, they are all really the same, and I would try to play them against each other if you can’t get a better price. Frommer’s suggests the best time to hike the Inca Trail (Machu Picchu) is June to September, so during these months it might be harder to negotiate a good deal. The other suggestion, which was reiterated by our pilots: the morning is the best time to fly as the winds are at their lowest. Neither Alex nor I got airsick, though we both took motion sickness pills before we went up (rather be safe than sorry). The tour is quick, but you get excellent views of the lines (note there was going to be a GoPro video, but the camera couldn’t distinguish between the lines and the sand, very disappointing). 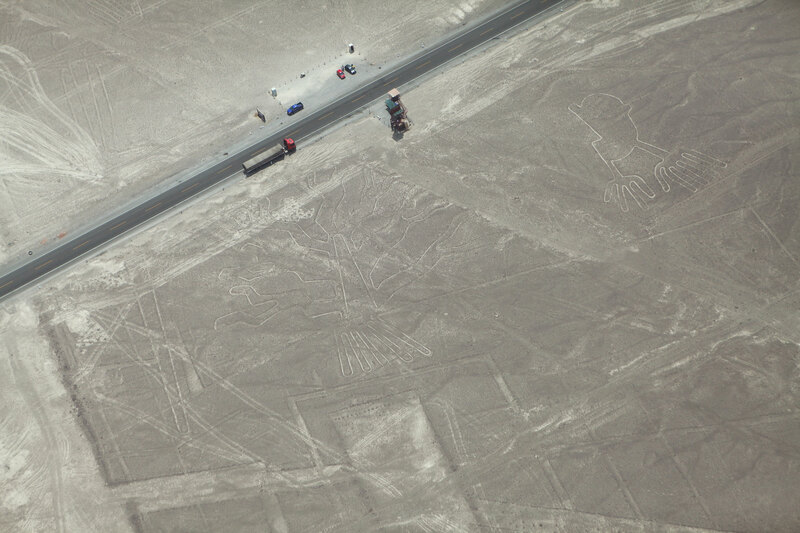 If you are near Nazca it is definitely worth a trip to see the lines, they are quit amazing. Alex and I both commented that we thought they were going to be bigger, as many aren’t as big as the most famous, ‘the hummingbird’. Overall it was great experiencing, something that I learned about in middle school and never thought I would see in real life. 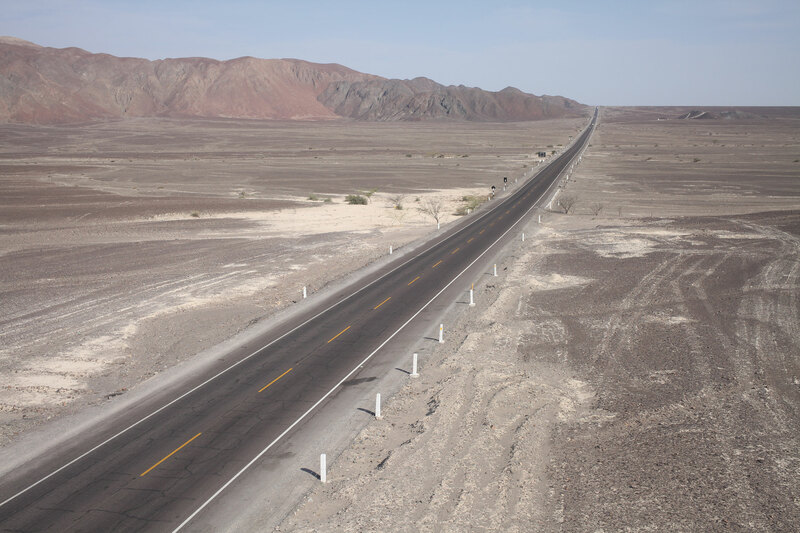 Unfortunately for most travelers, if it wasn’t for the lines themselves no one would bother to go to Nazca (no offense to the people that live there, I myself am from a tourist town) as it is in the middle of desert that is transitioning into mountain terrain. The town has created other tourist attractions (sand boarding and tours of Inca sites), but the real draw for this tiny town are the lines. After our morning flight and some late breakfast, Alex and I were exhausted. I don’t know if it was being in the sun the last couple of days, or simply the wear of travel, but we both crashed for most of the rest of the day. It must have been what our bodies needed, because we have been on a roll ever since. From Nazca it was a race to get to Cusco, up into the Andes Mountains. Peru finally showed us some of the famed countryside, Swiss style mountains and rolling hills that look like they could house something like Machu Picchu. It was great to finally get out of the desert, and into some lush terrain. We thought we could get to Cusco in two days, but riding through mountains make for slow going. Between Nazca (1,710 ft) and Puquio (10,545 ft) we climbed close to 9,000 ft in elevation. After inquiring with a gas attendant in Puquio as to how far the next town was, we decided to stay the night and enjoy the ride the next day instead of pushing it to the next town. I suggest to any riders doing this section of Peru to do the same if they have time in their schedules because the ride from Puquio to Abancay is some of the best scenery and one of the top five rides of the trip! 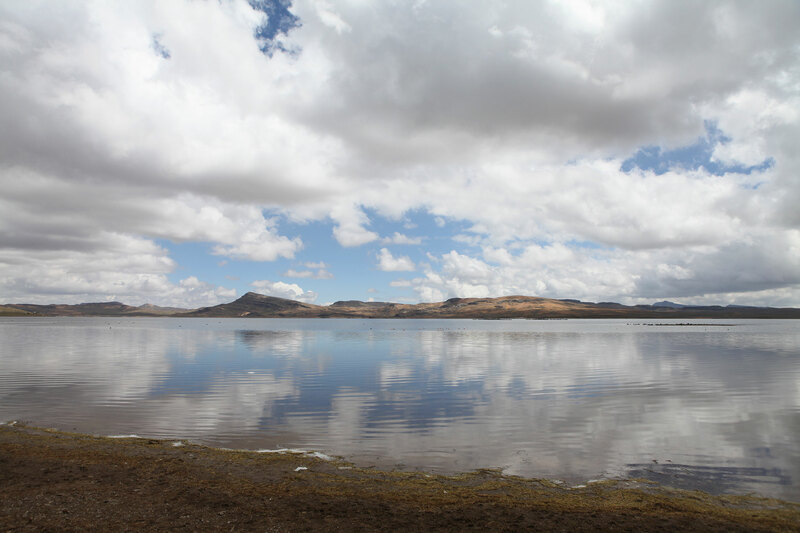 From the moment you leave Puquio you climb into the mountains and are treated to lakes with wild flamingos, herds of roaming llamas, and endless scenic valleys. Alex and I took most of the day to ride this stretch of road, stopping often to gawk at llamas or stare at the scenery. I commented to Alex that if people ask me what was the best part of the trip when I get back, that days of riding like this were by far the most enjoyable. You don’t know when you wake up that day what your in-store for and it makes the experience all the more sweet. What a trip. I am sitting in 5 degrees and snow looking at these fantastic pictures. Something you will never forget. Thank you for sharing with us. That is too cold for us, but if we don’t get moving I think 5 degree weather is what we will be in for when we hit the bottom. Think warm thoughts and thanks for following along. What an incredible adventure! I was just living in Peru for 6 months, but never make it as far south as Nasca/Nazca (the spelling with the ‘s’ is the correct spelling in the Spanish language, while ‘z’ is used for the English language spelling). I loved the video. Happy adventures in Cusco and beyond! Thanks for the comments, and the info on Nasca versus Nazca. What really tripped me up was that in the city itself there were multiple signs with both spellings. Hope you enjoyed your time in Peru! Thanks Berry, your continued support is much appreciated and makes all the effort worth it.